The Samsung NX20 with an 18-55 mm lens rolls out as a high end camera of the NX Interchangeable lens series. Sporting a 20.3 MP mirrorless interchangeable Lens, it showcases resemblances of a DSLR, but comparatively weighs less than them. The Samsung NX20 has a compact design that easily fits in your hands. The built-in Electronic View Finder adds to the compactness of the camera and gives it a look of DSLR rather than an oversized Point and Shoot. It weighs around a pound and has the buttons and wheels aptly placed for convenient control. The front part of the camera comprises of buttons for recording movie/video mode, Drive mode, Metering, Exposure Equalizer and the ISO. The dial for the mode selection option and a regular control wheel are placed on the top panel. The rear end of the camera contains the DSLR buttons and a big preview screen, above which is placed the view finder. The connectivity options, which are Micros HDMI port and a Mini USB port, are placed on the bottom left corner of the camera. One of the interesting features of the Samsung NX20 is the Fn controller. Just a single press of this button will present you with several convenient options such as settings to manage and control the image size, exposure levels, drive mode and others that can be toggled using the wheel provided. The interface is smooth and easy to access with sensibly placed menu options. Also, the other best thing about the device is its Wi-Fi connectivity. Perhaps, Samsung offers one of the best Wi-Fi powered cameras in the industry! Once connected to a Wi-Fi network, you can use your NX20 to directly upload and post photos to the social networking websites and other file sharing platforms. Furthermore, it allows you to save a copy of it on your SkyDrive account and eases out the process of file transfer between computers. The quality of the pictures is quite commendable, though it has some minor-minor flaws. The detailing and the color representations are fine, but just that any subject with a lustrous background tends to overshadow the subject on the picture. The lens and its mechanisms work great and the ISO level can go as high as 12k, which is commendable. Also, the camera can capture and record videos at various levels of ‘p’ such as 1080p, 720p and 810p. The device records video in Mp4 format and offers a neat and clean output. One of the features that lack in this camera is the presence of a microphone. So, no audio for you! But, the users can however buy an additional Samsung camera-compatible microphone that comes at additional charges. The Autofocus feature definitely is worth mentioning along with the image stabilizing feature that nullifies any camera shakes and movements. As far as the battery life is concerned, it is powerful and takes over 350 snaps before it completely drains out. 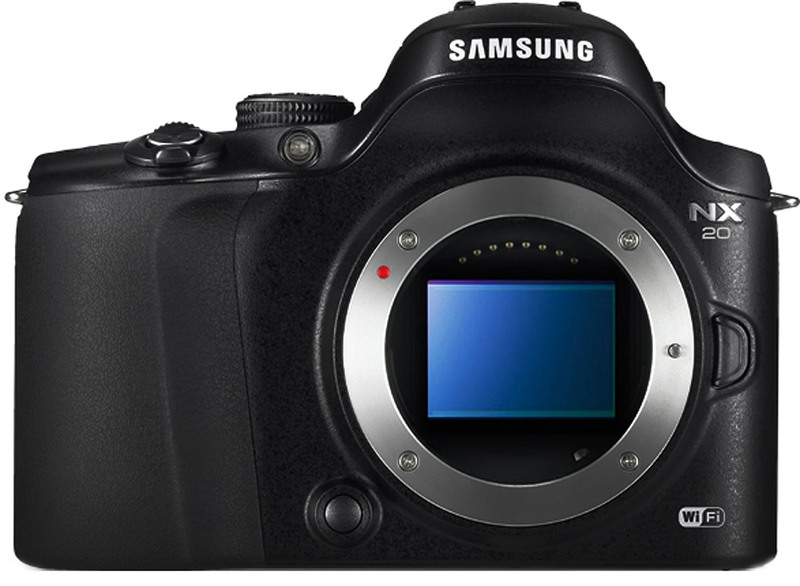 Samsung NX20 has all the great features that makes for a perfect camera, but not for the price. There are some entry level cameras that showcase some exceptional performance for their price. So, the bottom line is that the issue lies with the pricing and not the camera. Go for it if you have some bucks to spend!